The Robert F. Kennedy (RFK) Bridge (1936), colloquially and originally known as the Triborough Bridge (sometimes spelled Triboro Bridge), is a complex of three separate bridges in New York City, United States. Spanning the Harlem River, the Bronx Kill, and the Hell Gate (part of the East River), the bridges connect the boroughs of Manhattan, Queens, and The Bronx via Randall's Island and Wards Island, which are joined by landfill. The bridge is owned by the City of New York and operated by the MTA Bridges and Tunnels, an affiliate agency of the Metropolitan Transportation Authority (New York). Often still referred to as simply the "Triboro" the spans were officially named after Robert F. Kennedy in 2008. The toll revenues from the Triborough Bridge pay for a portion of the public transit subsidy for the New York City Transit Authority and the commuter railroads. The bridge carries approximately 200,000 vehicles per day. The bridge has sidewalks in all three legs where the TBTA officially requires bicyclists to walk their bicycles across due to safety concerns. However, the signs stating this requirement have been usually ignored by bicyclists, while the New York City Government has recommended that the TBTA should reassess this kind of bicycling ban. Stairs on the 2 km (1.2 mi) Queens leg impede handicapped access. Here's the our members favorite photos of "Bridges in New York City". 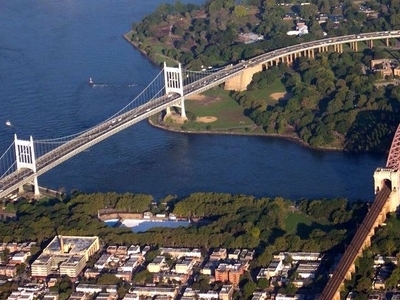 Upload your photo of Triborough Bridge!